GSMArena team, 08 September 2016. The Honor 8 is powered by an in-house Kirin 950 chipset. The model number doesn't suggest a big change compared to the Kirin 955 inside the P9. In fact, it's the same chip to power the Mate 8, and the difference is almost insignificant. The Kirin 950 SoC features an octa-core CPU with four Cortex-A72 cores clocked at up to 2.3GHz (compared to the 2.5GHz of the Kirin 955's), and four Cortex-A53 cores ticking at up to 1.8GHz (same as Kirin 955). The GPU is again a quad-core Mali-T880 MP4. 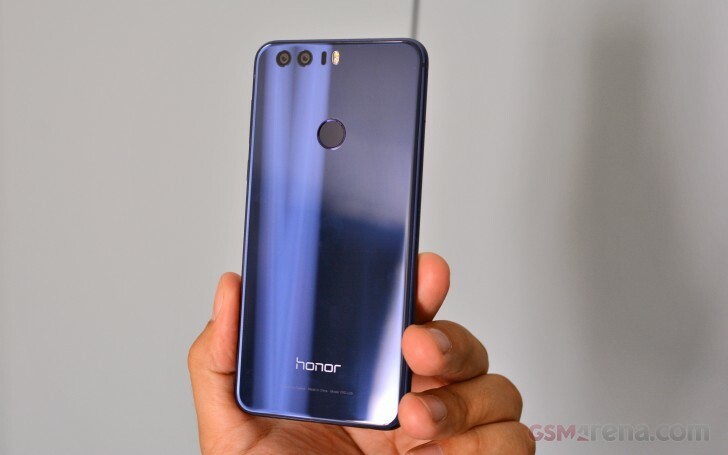 The Honor 8 comes with 4GB of RAM on both the 32GB and 64GB models, unlike the 3GB-powered 32GB Huawei P9 model. The performance of a single Cortex-A72 core is rather uninspiring compared to the Snapdragon 820's Kryo within the OnePlus 3 and the Galaxy S7. It's on par with the same core inside the P9 and P9 Plus albeit the lower frequency. The multi-core test is where the Kirin 950's CPU shines - it slides just below the P9 duo, and yet it bested every other smartphone in its price range. The compound AnTuTu 6 test gives the Honor 8 a pretty close score to the P9 duet, the minor difference accounts for the lesser CPU frequency. The score trails behind the current crop of flagships though, probably due to the lower-grade GPU. The BaseMark OS 2.0 test paints a lot more positive, because in addition to CPU, GPU, RAM, and UX, it also gauges web and storage performance, plus overall OS behavior. Here the Honor 8 scored an excellent mark and is on par with the P9 duo and the Galaxy S7. The OnePlus 3 has an advantage of a high-end GPU running on a 1080p resolution. It's the graphics department where Kirins are often not quite up to par. While the Kirin 950 and 955 use Mali-T880 MP4 (quad-core) graphics, the flagship Galaxy S7's Exynos utilizes Mali-T880 MP12 (12 cores), hence the big difference. Qualcomm's Adreno 530 within the OnePlus is the best, though. Unlike the Galaxy S7 the Honor 8 runs on 1080p resolution, which gives it an edge over the Quad HD Korean flagship and thus real-life performance is closer. The OnePlus 3 is once again ahead of the curve because of its S820 GPU and 1080p screen. The Kirin's GPU is on par with S650's Adreno 510 GPU inside the Xperia X.
BaseMark X GPU test clearly shows the superiority of Galaxy S7, and OnePlus 3 and it puts the Honor 8's GPU on par with the Adreno 510 inside the Xperia X and Redmi Note 3. As expected, the Honor 8 packs top-notch CPU punch and just enough GPU power for its 1080p display. While its GPU performance may not be the best in class, there isn't a single game the Honor 8 can't handle right now. And it offers a ROG power-saving mode that lowers the screen resolution down to 720p, which will not only save you some battery, but allow for higher framerates if needed.